Hello, dear readers. 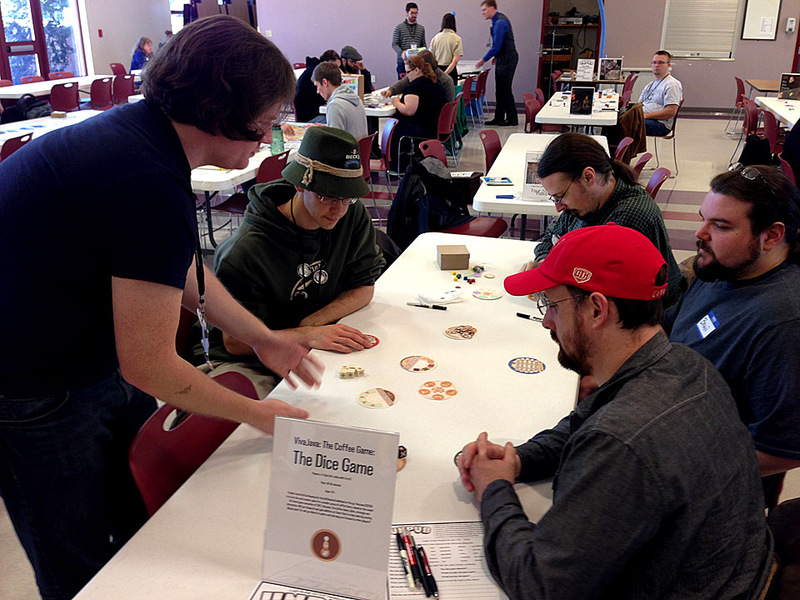 As many of you may well know, I attended the third annual Unpublished Games Festival in Magnolia, Delaware (more commonly known as Unpub 3) this past weekend. There were over 40 designers present with more than 60 unpublished games in various states – from the nearly-production ready Compounded to the line-art and paper cutout Brewmasters. What follows is a brief pictorial wrap-up of what I got a chance to see and play over the two days of the fest. Even though I showed up to try out as many games as possible, I was only able to get to about nine different games. What I will say about the games I played though – all of them were fun and excellent creative endeavors. On with the pictures! Shortly before Unpub 3 kicked off, Compounded designer Darrell Louder and I learned that Compounded had been fully funded on Kickstarter! Since the first Unpub was the official birthplace of Compounded, it was a very happy anniversary present, indeed. 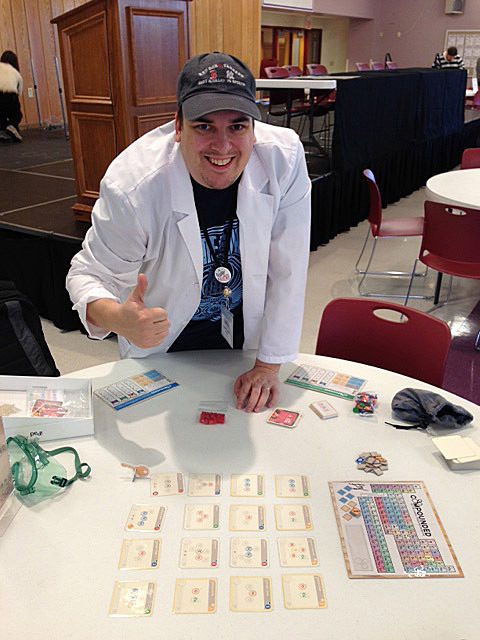 Darrell ran a ton of Compounded demos during Unpub, gathering lots of positive feedback. 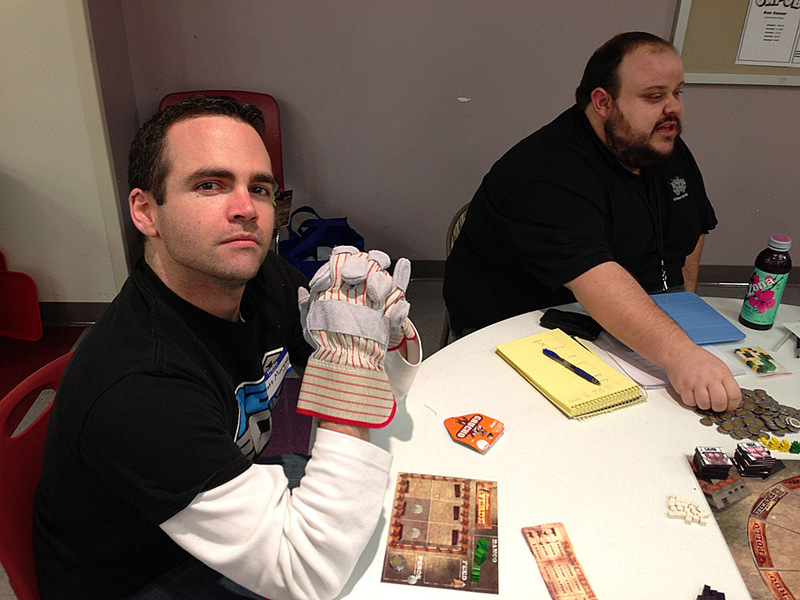 Here, the incorrigible Patrick Nickell of Crash Games finally gets to play a full game and is obviously enjoying it. One of the first games I tried out was Charlie Hoopes’ AtataT. 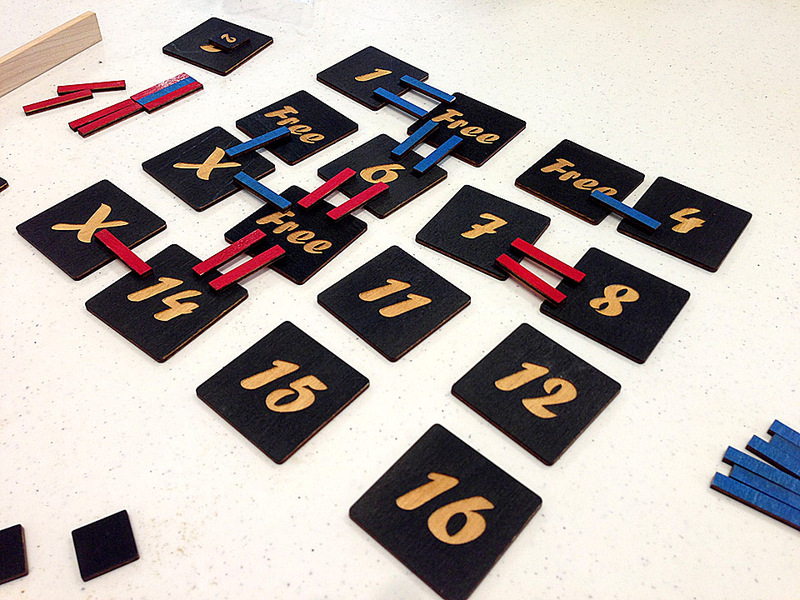 In the game, you alternate placing colored planks between numbered tiles that may match numbers held secret in your hand. When you connect two of your numbers with a contiguous line of planks – regardless of color – you collect the planks as points. It’s a really easy concept and very fun to play; a nice throwback to some of the parlor games of the 50s and 60s. 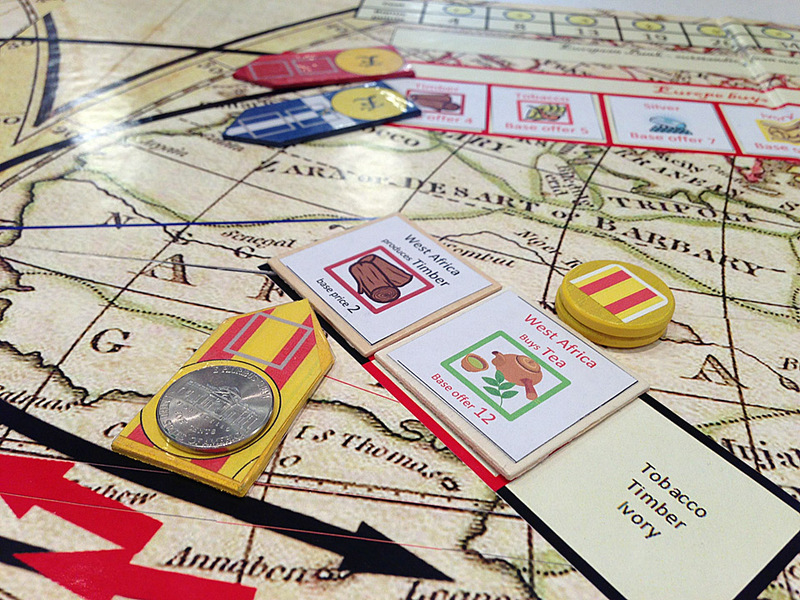 VivaJava designer TC Petty III was on hand to demo three different games, one of which may look a bit familiar. 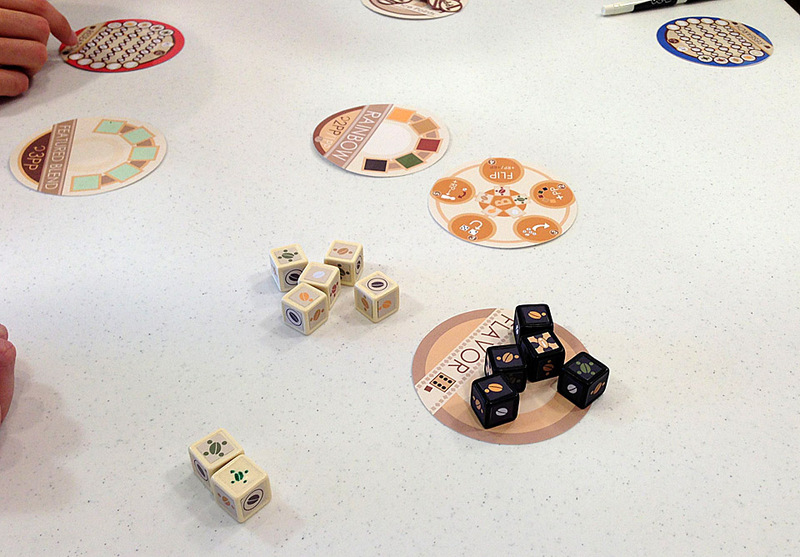 Here he shows off the lighter sequel to VivaJava – VivaJava: The Coffee Game: The Dice Game. This dice-based game is geared for 2 to 4 players, and utilizes 15 different custom dice of two different types. The variability of the game is off the charts, with tons of interchangeable Research power discs to give players all sorts of ways to score points, manipulate the dice and blend their way to victory! Constant readers of Dice Hate Me will no doubt recognize this not-so-little gem – it’s Fred MacKenzie’s Princes of the Dragon Throne! I didn’t get a chance to play it, but I’ve played the version that was shown at Unpub and it’s truly awesome. Look for it on Kickstarter later this year. 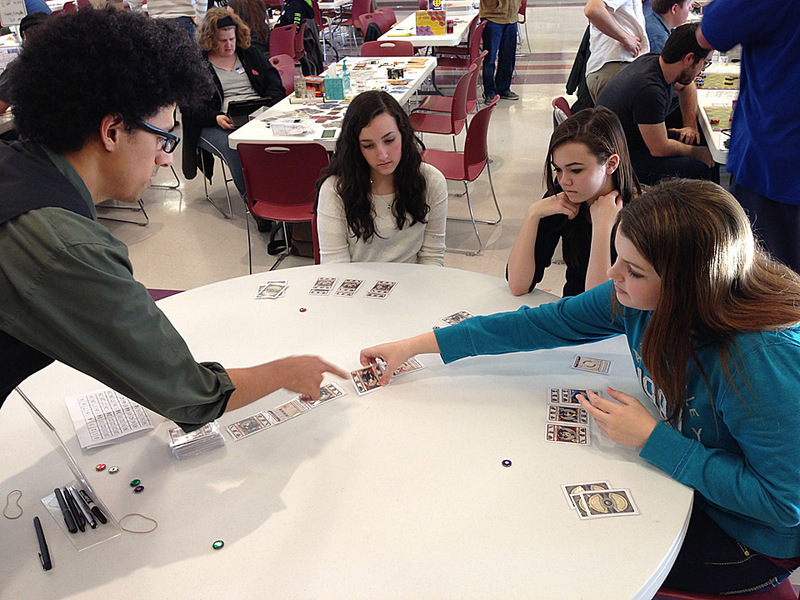 One of the best games I played at Unpub was Garrett Herdter’s Rolling for Amusement. In this press-your-luck dice game, players are trying to build the best amusement parks from multi-purpose cards in their hand. The cards can be used as points when parks are built, as unique abilities that allow manipulation of the dice, as offensive abilities that can make other players’ builds more difficult and as future plans that add a persistent affect from round to round. I’ll have more about the game – and some quotes from Garrett – in the next State of Games podcast (that’s Garrett in plaid). Some of you may recognize Paul Owen from other pictorial updates on Dice Hate Me, most notably from this past year’s World Boardgaming Championship round-up. 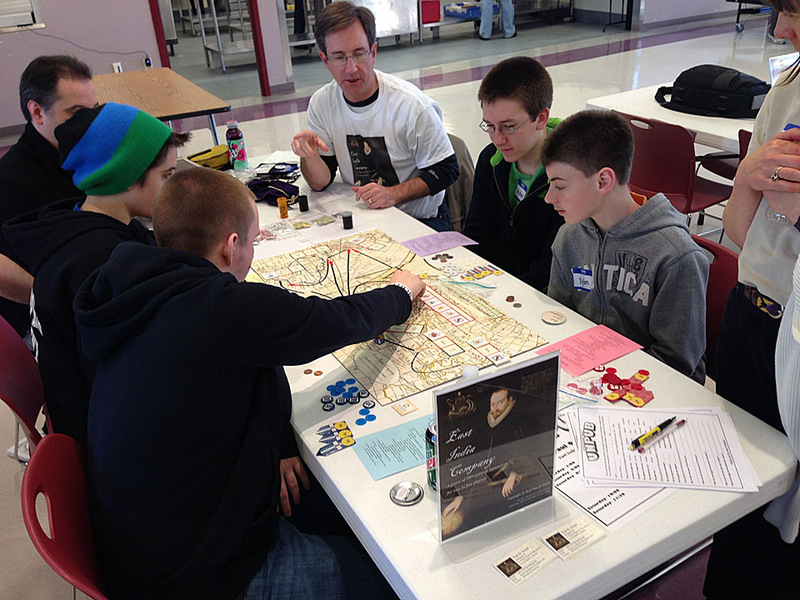 At the WBC, we had the pleasure of playing his nautical pick-up-and-deliver economic board game, East India Company. 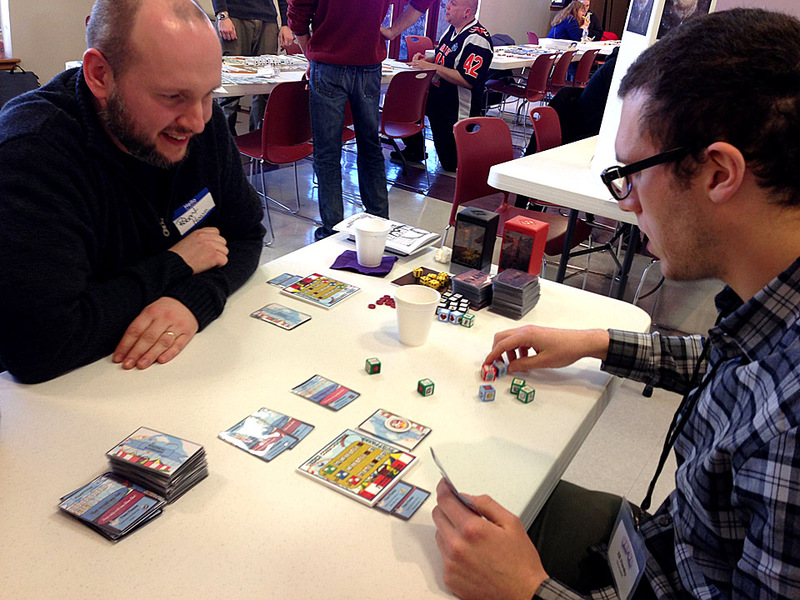 Paul was on hand at Unpub 3 with a spiffy new prototype and some streamlined gameplay. I was lucky enough to get a chance to play once again and the improvements to the game are outstanding. This one is shaping up to be great, and it will be one to watch in the next few months as Paul continues to playtest and improve on an already award-winning build. Another of TC Petty’s designs hit the table – Club Zen, co-designed by Luke Winters. This quirky worker placement Euro gathers a group of players at a 7-day relaxation spa. The goal – to be the most relaxed spa guest at the end of the week. 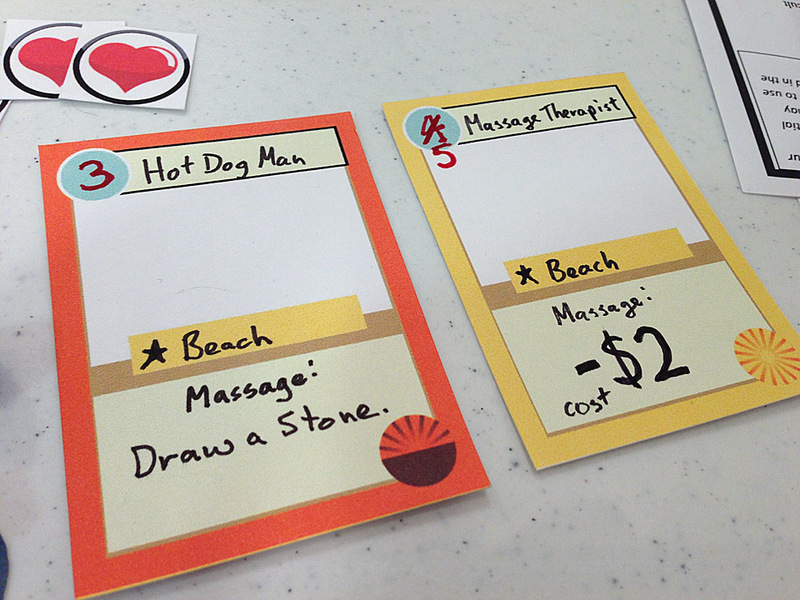 During the game, players amass emotional and work stress and must figure out the best way to relieve that stress through the magic of buffets, massages, night clubs and with the occasional help of sometimes-strange locals and workers that pop up around the spa, like the Hot Dog Man and the Local Child. I had a blast playing this one and even though the scoring needs some work, I can’t wait until I can try it out again. Patrick Nickell had one of Crash Games’ upcoming titles at the show – Rancheros, designed by Nickell. Here, geek extraordinaire Matt Morgan demonstrates the best livestock wrangling techniques with his handy worker gloves. 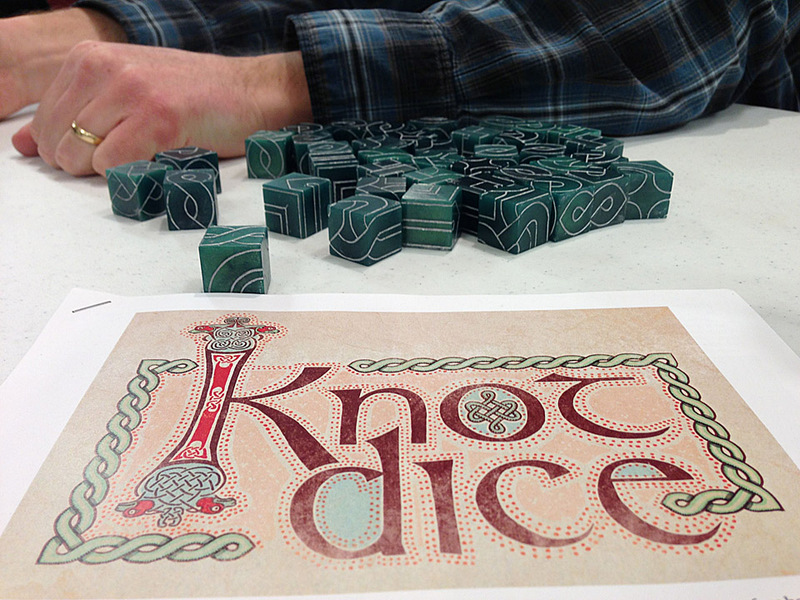 Matthew O’Malley’s Knot Dice is a beautifully-crafted game system that utilizes custom dice that create intricate Celtic knots. 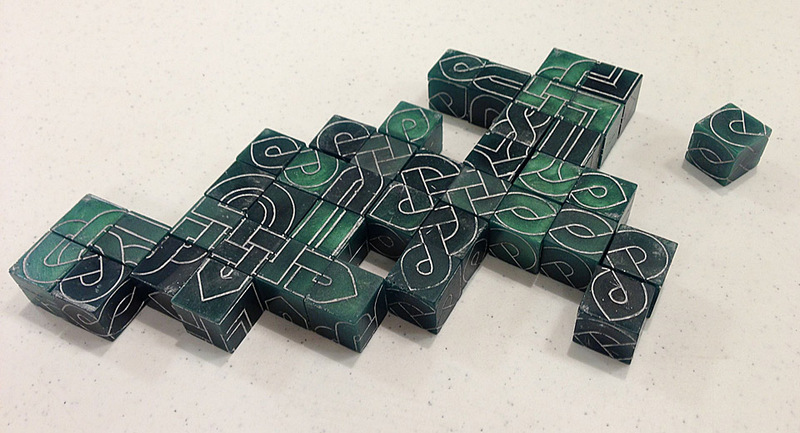 The base game involves rolling the dice and then taking turns placing the dice in such a way to connect everything and completely close off the knot using the most dice possible. It’s a lot of fun and produces a truly beautiful piece of art when the game is over. A staple of Unpub at this point is Josh Tempkin’s Wartime. We’ve talked about Wartime on previous State of Games podcasts about WBC, but essentially it’s a real-time tactical warfare game that is guaranteed to make your blood pressure spike! Our friend Ben Rosset – designer of Mars Needs Mechanics – was in attendance with two of his newest game builds: Brewmasters and Brewmasters The Card Game. 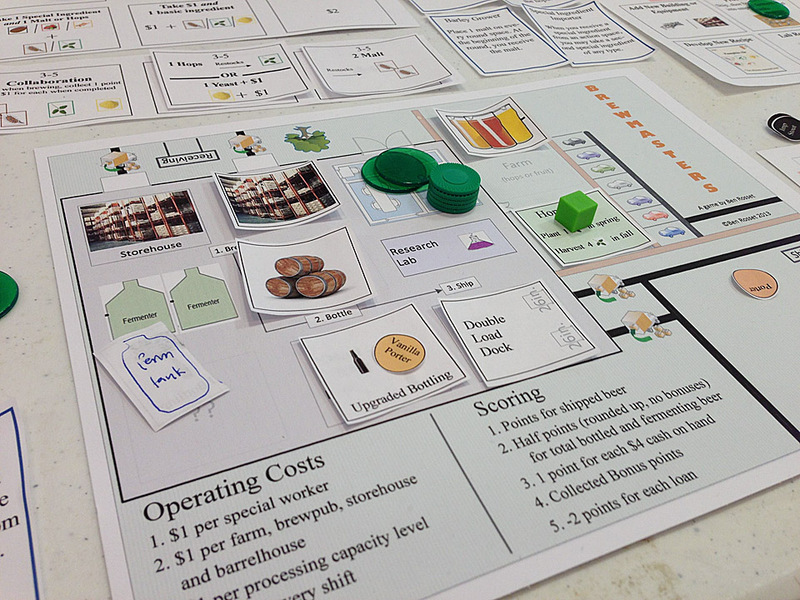 The original brewmasters is a worker placement, resource management game where players manage beer microbreweries, researching new and tasty beer recipes and producing them for an eager public. It’s pretty deep and definitely thinky, but it’s also a whole lot of fun. I didn’t get a chance to play the card version, but word on the street is that it’s fast and a lot of fun, as well, so I’ll have to keep an eye on both as Ben continues to develop the games. 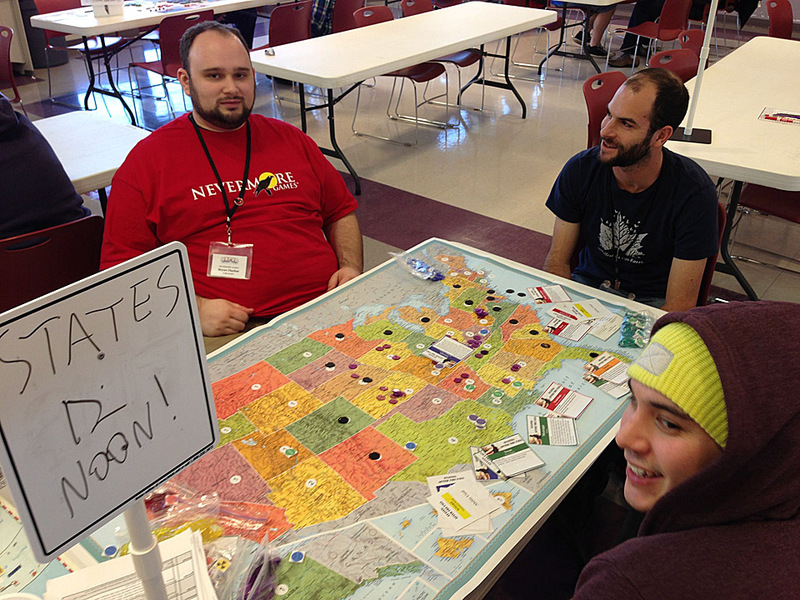 Bryan Fischer of Nevermore Games and designer Mike Swiryn were at Unpub 3 to play and test out States After the Fall. 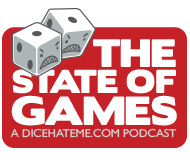 Many of you have heard mention of States on Dice Hate Me and the podcast, and it’s definitely a favorite. Nevermore Games has officially signed the game and will be bringing it to Kickstarter later this year. It’s going to be massive and awesome, so stay tuned as we learn more about production development. Idea machine Daniel Solis made the drive up to Delaware with me to show off his Victorian party card-drafting game, Belle of the Ball. Daniel was a real demo machine, cranking out 30 playtests over the course of the two-day event. Many people walked away saying it was their favorite of the show, and Daniel got a ton of great feedback that he’s sure to use to hone Belle to a finely-crafted final project. 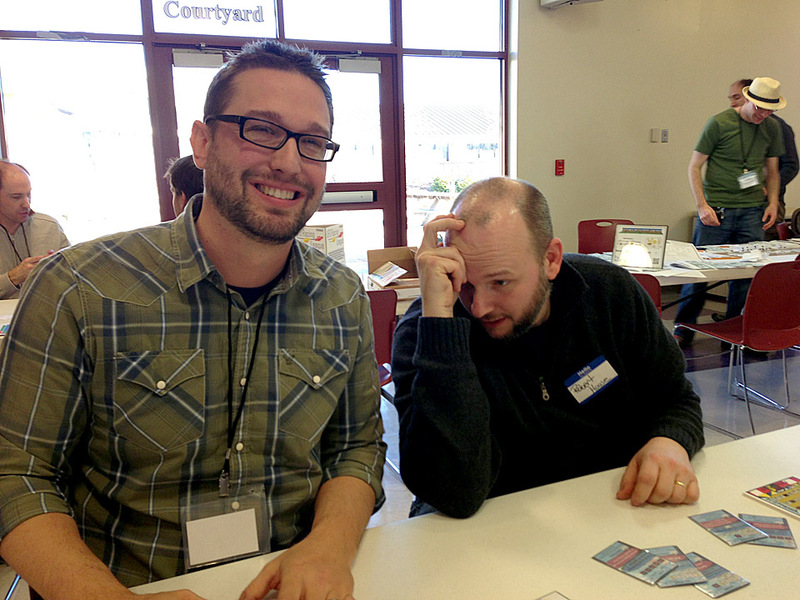 Well, that wraps it up for this recap of Unpub 3. 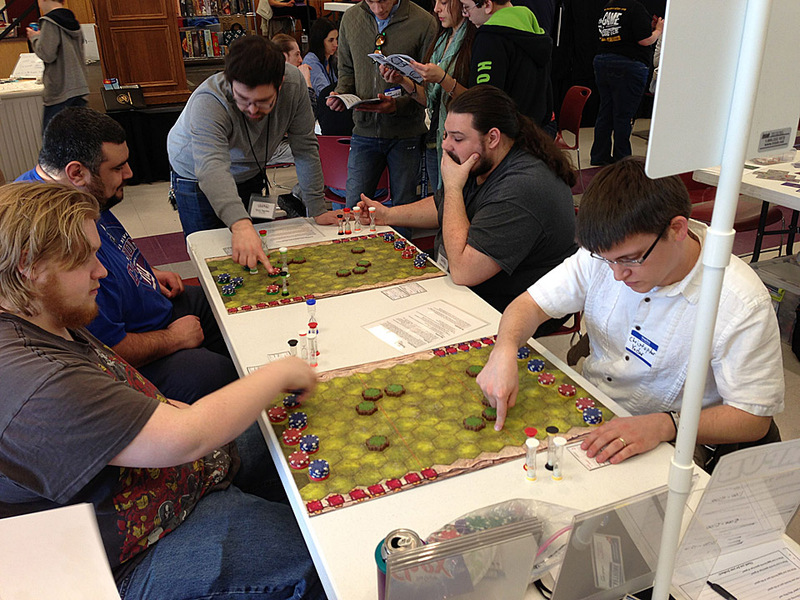 It was an amazing show, and a real success for the Unpub program. 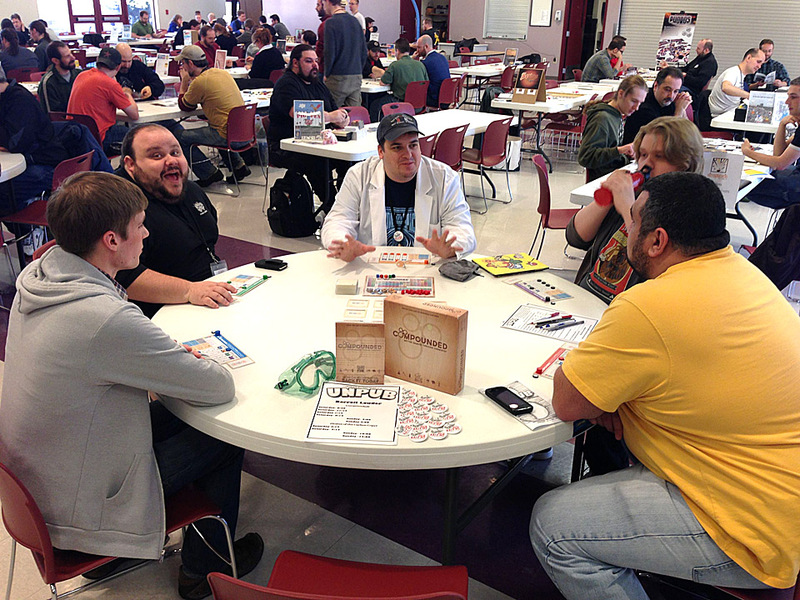 I look forward to Unpub 4 next year at this time at the same venue and with new games to discover and test! Good stuff–thanks for the coverge. Wish I could have been there. I heard that GrandCon got a mention and some applause. Any word on what that was about? Have to agree with your opinion of PDT. I have finally sunk deep enough in it to finally get it. My first 2 plays I just could not grasp what was going on. Now on my 3rd play and really liking it. Great write up! Thanks for all the pics! 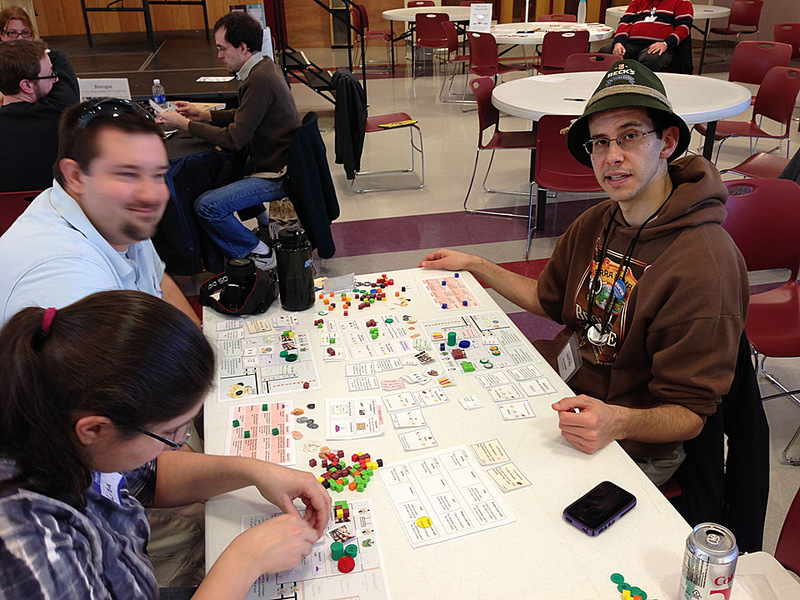 Awesome look at UnPub3. Wish I could have been there! Looks like everyone had a great time. Thanks for the wrap-up! 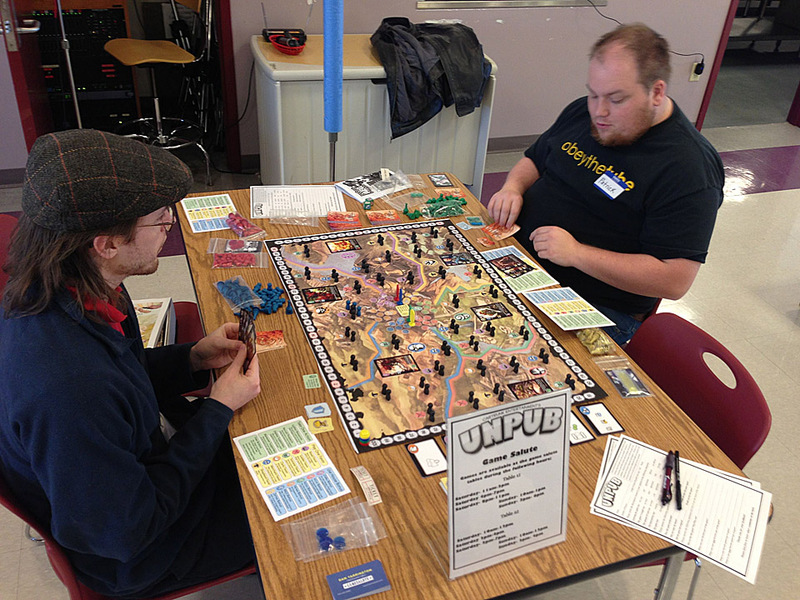 Chris, it was great to see you again at UnPub. So sorry Cherilyn couldn’t make it. I especially appreciate your comments and feedback on “East India Company.” I’ll keep scraping off the barnacles and tightening down the rigging to get it all ship shape and ready for sea. Oh, and of course, major congratulations for blowing the doors off Kickstarter with Darrell L.’s “Compounded.” Well-deserved. That’s a great game, and I can’t wait to see the production copy.